Pastry chef. Those two words bring visions of cupcakes, bread, and cookies floating into your brain. Of course, like Pavlov’s dogs, your mouth starts watering in response. Can you think of a better way to spend your days than decorating desserts with dainty daisies, or glazing and garnishing a multilevel torte? 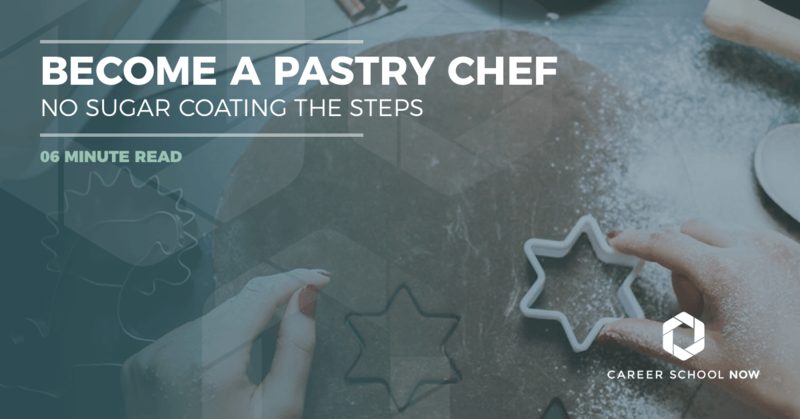 If the thought of a pastry chef career has you on a sugar high, then it’s time to take a look at the recipe for success! Find a baking and pastry program in your city. And check out the culinary programs, where you can also learn the art of pastries. Oh! How sweet a sound are those two words: “pastry chef.” But, aside from the sugary job title, what is it exactly? Pastry chefs work in many different places, creating doughy and dessert-y masterpieces. They have learned the art of making breads, desserts, and other baked good varieties that most carb and sugar addicts crave. You’ll find them in professional kitchens (and in many private residences) around the world. They might work solo, or as part of a team of confectionary creatives. They may also be employees, or employers. Their position is as versatile as their imagination allows. Culinary arts has a cool history, check it out here. There is a lot more to the job of pastry chef than simply making, well, pastries. Someone needs to run every aspect of that kitchen. Very often, most duties such as inventory and menu planning fall into the flour-dusted hand of the pastry chef. If this sounds like a super sweet job to you, then read on to find out more! PASTRY CHEF? BAKER? WHAT'S THE DIFFERENCE? You may hear folks use the two terms interchangeably, but the roles aren’t exactly the same. The main difference between a baker and a pastry chef is the fact that bakers specialize in breads, rolls, cookies, and quiches, among a whole menu of other scrumptious yummies. A pastry chef focuses more on dessert-related products, as mentioned earlier on. However, bakers can choose to become pastry chefs, and pastry chefs are already considered bakers. And since the term “chef” means boss, pastry chefs earn more than bakers. But in the end, either position could be enjoyable to you. It just depends on where you want to go with your career. WHAT'S SO SWEET ABOUT BECOMING A PASTRY CHEF? Just like any other job in the world, you have to take the good with the bad. Being a pastry chef means you’ll face both. The Sweet: You can use your creativity to the max. You’re not going to be as hurried as other types of chefs: After all, perfectly risen cakes take time, and many desserts might be made in advance. You can take your art with you anywhere in the world, and in many different environments, from personal kitchens to cruise ships and beyond. The profession is known to have a high job satisfaction; which many careers can’t claim. The Sour: Your hours may be long and irregular—many times, they start in the wee hours of the morning or continue late into the night. Some shifts may last twelve hours. There is a lot of exhausting repetition: lifting heavy bags of ingredients, preparing the same dessert over and over. There is a risk of injury—burns, cuts, a bad back from standing, but nothing too out of the ordinary. And depending on where you work, it can be a bit stressful. There are different ways you can become a pastry chef. While there really are no formal educational requirements, employers do have a tendency to like those degrees and certificates. Don’t be fooled though, a good pastry chef is a good pastry chef, no matter what path they took to become one. Formal training can be in the form of a certificate, diploma, or degree. Culinary and pastry chef programs are available through culinary schools, community colleges, trade schools, and universities. The hardest part is deciding which way to go. Curious about the difference between a culinary arts certificate or associates degree? Another option, although not highly recommended, is through online courses. Most of the pastry and baking instruction online is geared toward a casual baker, someone wanting to learn but not as his or her profession, necessarily. If you do decide to go the online route, you will still be expected to take the lab portion in a classroom. Rightfully so, you need that hands-on experience if you want to be a successful pastry chef! The benefit of formal training is that you’ll learn techniques you may not pick up through being self taught. Post-secondary education will teach you about food sciences and baking chemistry, both important factors when cooking or baking. Math is also an important course to take, because you will need to be able to read and modify recipes and amounts of ingredients. Not to mention, you need precision when it comes to temperatures and food chemical reactions. During your formal education, you’ll also have an internship where you’ll be completely hands-on. After graduation, you may want look into an apprenticeship, where you can learn directly under a professional pastry chef. Apprenticeships can also be done in lieu of formal training, but it’s not as common a route. However, it is a paid education. Meaning, you get paid either hourly or salary (but not as much as the pastry chef training receives) as you’re working and learning. For some, this is a much more practical and attractive alternative. Plus, nothing beats learning as you go under the watchful eye of a professional pastry chef. But don’t think you’ll get out of having some coursework. Apprentices still have to take 12 formal courses including food safety, nutrition, and management, among others. Your schooling will take anywhere between 2-4 years. That’s including your internship. Apprenticeships are 2-3 years. Why yes, there are certifications available. They are voluntary and, depending on who you ask, highly recommended. Getting certified adds another layer to proving you have those mad kitchen skills. In addition to apprenticeships, organizations such as the Retail Bakers of America and the American Culinary Federation also offer various levels of certifications. You can be a certified Journey Baker, Certified Baker, Decorator, and Master Baker. Specific to pastry artists are certifications such as the Pastry Culinarian, Working Pastry Chef, Executive Pastry Chef, and Master Pastry Chef, all of which has the word “certified” in front of those titles. The median wage for for bakers, including a pastry chef, is a bit over $25K, with some making $40K and even higher. Realistically, your pay will be based on experience and where you work. Employment growth for this profession is projected to be around 6 percent through 2026. With the national average falling between 5-7 percent, this is right in the middle of average. The more experience, and the better your skill set and portfolio, the better your chances of landing a sweet gig. So, if your goal is to someday own your own bakery, or work in the kitchen of a five-star restaurant in Europe, then you can with the proper training and your talents perfected. Becoming a pastry chef sounds pretty sa-weet, doesn’t it! Hey, is anyone else craving a cupcake right now?